It's that time of year again...time to start the holiday baking! Last year I baked a batch of cookies for each of the eight weeks leading up to Christmas. It was a really good way for me to have a nice varied cookie tray yet not feel overwhelmed with making a lot of cookies at one time. My first batch, on Matt's request, are these chocolate & hazelnut biscotti. Now, biscotti aren't something I normally associate with Christmas but when I think of how good these will taste with a hot cocoa or even some hot spiced wine it makes total sense. 1/2 c unsalted butter, at room temp. Preheat oven to 350 F. Place the nuts in a roasting pan & roast in the oven for 9 minutes until lightly browned. Remove from the oven & let cool a little. Rub off the skins the best you can with your fingers or in a towel. Chop finely in a food processor. In a large bowl beat the butter & sugar until fluffy. Add eggs & rum then beat until well blended. Mix in the salt, baking powder & flour. Fold in the nuts & chocolate. Divide the dough into two piece. Form it into two logs, about 14-inch long and 1/2-in thick on a greased & floured cookie sheet, leaving about 2 inches between the logs. Bake for 25 - 30 minutes until starting to brown. Let cool 5 minutes. Cut into 1/2-inch slices. Place cut side down on the cookie sheet & bake for 10 - 15 minutes more. Cool on a rack. I don't like this time of the year. So much dieting and working out mean nothing when these delicious recipes start to pop up every where, LOL. I loved seeing all your cookies last year and this year I think I will follow your lead in making these weekly so I don't have to worry about last minute baking as I am doing my last minute Christmas shopping! Did the Dulche de Leche Sandwich cookies from last year turn out well after being frozen with the filling? Kari - The dulce de leche cookies did not end up freezing well at all. I think I need to play with that flavor for a new cookie this year. I love your weeks of cookies and these look fabulous! These look fantastic! How do you store them? Freezer til Christmas? wait, hot spiced wine? why have i never heard of this phenomenon? i don't care for wine, but then again, i've always had it unspiced and either tepid or chilled. perhaps spiced and hot is the way to go. 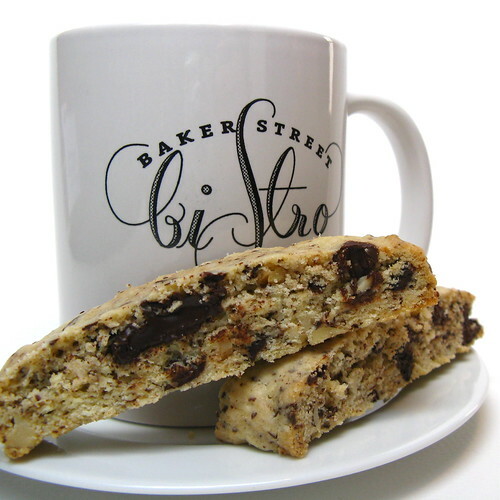 Mmmm - biscotti are always a winner no matter what season. I especially love them when chocolate is involved. This looks yum! My sister and I were thinking about making biscotti for gifts this Christmas, so she went hunting for recipes, and found yours! It looks deee-lish! I decided to post a link to your recipe, as I want to try it soon. And thanks for the idea of doing something every week. I've always loved the tradition of Advent Calendars to mark off the big day -- a baking advent sounds just as wonderful. It's crazy to think that Christmas is already so close. I was out shopping today and the stores are already full of Christmas things. I still have never made biscotti - maybe this year will be the year for me. Oh man, these look fabulous Kat! I mean, gotta have 'em, delicious!! I definitely associate biscotti with the holidays! They are naturally perfectly shaped for dunking into tea/coffee/cocoa/etc. and what is more festive than dunking? Just discovered your blog and these amazing biscotti have me hooked! I love making - and eating - biscotti and these will definitely be tried in my house. If I had these around here, I'd go make a third coffee for the day.